Posted by Iris Yan on 4/19/2019 10:07:59 AM. Kindle Fire is a tablet running on Amazon-modified Android OS. It not only does everything an Android tablet is supposed to do, but also allow you to read eBooks and listen to audiobooks on it. Some people may find that reading ebooks on Kindle Fire will drain their eyes but you will feel comfortable to read ebooks on Kindle e-Ink device. As reading Kindle eBooks on Kindle Fire is not a good option, how about listening to audiobooks on Kindle Fire? Listening to audiobooks on Kindle Fire will not damage your eyes, but liberate your eyes. In this article, I will introduce five methods to listen to audiobooks on Kindle Fire. As Kindle Fire is developped by Amazon company, it is also can be registered with the Amazon account. Once Kindle Fire has been registered with your amazon account, all Audible audiobooks purchased through your Amazon account will be displayed on your Kindle Fire. How to listen to Audible audiobooks on Kindle Fire? Below are detailed steps. Step 1. Open the Kindle Fire, you will find “Audiobooks” tab on the top bar of the home screen. All purchased audiobooks will be showed in the library when you tap "Audiobooks". If you want to buy a new audible audiobooks, just click ”store” at the top right to go to the store. You can type the book title in the search bar to find the book you want to buy, or just select one book from the “AUDUIBLE BEST SELLERS”. Then tap the title of the book and pay for this book. Step 2. Once the book has been successfully purchased, tap the “library” at the top right corner, all purchased Audible books will be displayed on cloud. Tap the title of the audiobook to download it. After the downloading has finished, you are able to listen to the audiobook even when your device is not connect to the wireless network. Next time when you want to listen to an audiobook, tap "Audiobooks" from the home screen, and then tap the book title, it will start from the place where the last time you stop listening. If you already have an Audible account which is different from your Amazon account, your purchased audiobooks will not be shown in your Audiobooks library on your Kindle Fire. You need to link your Audible account to your Amazon account in this case. Step 1. Go to Audible.com and sign in using your existing Audible account. There will be hi, username at the top of the website. Select the “Account Details” from the drop-down list of hi, username. Step 2. Click on NEW: Connect your Amazon account to Audible! to go to another page to merge your account. Step 3. Enter your Audible passwords, and click next step. Then enter your Amazon username and passwords and click on “next step”. Step 4. Select or enter a credit/debit card to use as your default card on Audible and click on” finish”. Until now, your Audible and Amazon account has been linked together successfully. And then when you open your Kindle Fire, you will find all your purchased Audible books will be showed in library of Audiobooks on Kindle fire. Then you can follow instructions of the situation 1 to listen the audiobooks. Note: When your Audible account has been merged with your Amazon account successfully, your old Audible username will no longer work. So you will access your Audible account with your Amazon credentials. One important thing to be mentioned about Audible books is that all Audible books are protected by DRM scheme. So all your downloaded Audible file will be in aa or aax format which means you are not able to play Audible file on many mainstream mp3 player as you like. In order to enjoy Audible at any player, you can convert Audible to MP3 with Epubor Audible Converter. Thanks for Amazon’s Whispersync for voice function and immersion reading feature, you are allowed to switch seamlessly between reading and listening. Before switching from Kindle books to audiobooks, you need to buy both Kindle eBooks as well as audiobooks. Tap the Books app to open the Kindle store on Kindle Fire and search the name of the eBook you are trying to find the audio book. Tap the eBook you purchased from the result. You will see “add narration for $” in the description page, and just click it to buy the audio edition of this book. Tap “Books” app on Kindle Fire, you will see all purchased books in the Library. Click the book title to start the reading. Since you’ve already have purchased the audio edition, just tap the highlighted area to download the audiobook. Once it has been downloaded successfully, tap the play icon to start the listening. To return your book reading, just tap on the overflow menu and then “immersion reading”. Now you can link your Kindle eBook to your Audible audiobooks, switching back and forth between listening and reading. Note To use this Immersion Reading feature, you have to make sure Text to Speech is turned off. To turn off Text to Speech feature, you have to tap the View menu , then select more settings, and then turn off Text to Speech. Although we can listen to audiobooks on Kindle Fire without extra audiobook player, but there are still many good apps which provide free audiobooks to download or listen online. There is already an article on our site has introduced 7 Best Audiobook Player Apps for Android. If you are interesting in installing another audiobook player for your Kindle Fire than its original audibooks, you may consider these powerful apps. 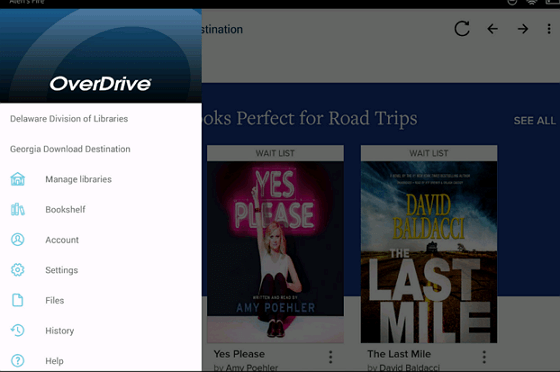 One of the famous apps is OverDrive apps which allow you borrow and enjoy audiobooks from your library on your Kindle Fire. You can follow the below steps to listen to audiobooks via this app. Step 1. Download the OverDrive app from here and install it to your Kindle Fire. Step 2. Once it has been installed successfully, you can sign in( or sign up) using your library card, facebook or a OverDrive account. If you're under 13, you can use one of the under-13 sign-in options. Step 3. When you log in the OverDrive, tap top left conor to open the menu, then click “manage libraries”. Then tap “+” to search your library by name, city or postal code. Once the library has been added, you can browse it to check whether this is any audiobook you want to listen to. If you find an audiobook available to borrow, just tap “borrow” and then enter your library card number to sign in. Once you log in successfully, check “download” under the book title on your bookshelf. Step 4. When this borrowed audiobook has been download successfully, you can tap the book to listen to this book on your Kindle Fire. To return this book, you can tap the plus symbol to the right of the audiobook in your bookshelf. Beyond Audible, there are also many wonderful websites where you can download free audiobooks, such as LibriVox, Storynory, Padiobooks and so on. To find more websites about downloading the free audiobooks, here are best 10 sites to download free audio books. Once you have downloaded audiobooks from these sites, you can transfer them to you Kindle Fire via USB Cable. Connect your Kindle Fire with you computer via USB cable. Then copy the downloaded audiobooks to the documents or music folder of your Kindle Fire. Usually, the downloaded audiobooks are in MP3 form and DRM free. Since the Audiobooks app on Kindle Fire will only play audiobooks in audible format from Audible, the audiobooks downloaded from other websites are mostly in MP3 format and will not be displayed on Audiobooks app. You will find them in the "music" tab on your Kindle Fire. Just click the title of the audiobook to play it. There are many websites provide free audiobooks which allow you listen to the audiobook online. 50+ Sites for Free Audio Books Online Listen without Downloading introduces more than 50 best websites offering online listening service. You can open these websites with the browser on your Kindle Fire and then click the title of the audiobook you want to listen to and play them on Kindle fire web browser. You can listen to the audiobook anytime when your internet is available. You need to keep you internet connected if you are trying to using this method. These are five methods about how to listening to audiobooks on Kindle Fire. If you have any good suggestions or ways, please share with us in the comments. If you have enrolled in Audible membership already but don't want to stick to Kindle related devices, Epubor Audible Converter can be the best audiobook converter to help you convert audible to mp3 or convert audible to m4b with 60X speed. Just give it a try. I am sure it will suprise you! 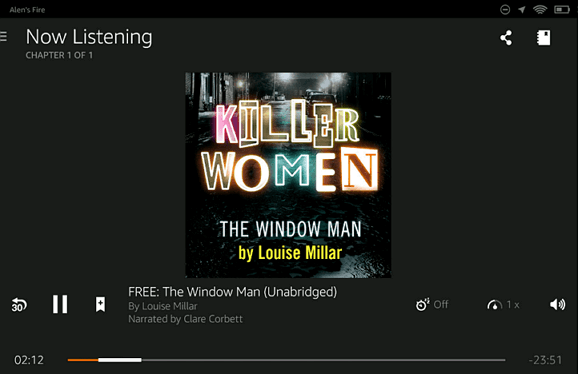 Just wanted to know, if I use the 4th method when I pause the audiobook will it play from were I left it next time? It is related to the player you used to play the audiobook~ You can just have a try. How about books that I just copied from audible and put them on a flash drive? All audible books are protect with DRM, so you can not listen to these audible books if you do not remove the drm from it. Epubor audible converter (https://www.epubor.com/audible-converter.html) can help you remove audible drm and convert audible to mp3. Then you can play the audible file at mp3 supported player.